The Michigan Wolverines football program represents the University of Michigan in college football at the NCAA Division I Football Bowl Subdivision (formerly Division I-A) level. Michigan has the most all-time wins and the highest winning percentage in college football history. The team is known for its distinctive winged helmet, its fight song, its record-breaking attendance figures at Michigan Stadium, and its many rivalries, particularly its annual, regular-season-ending game against Ohio State, once voted as ESPN's best sports rivalry. Michigan began competing in intercollegiate football in 1879. The Wolverines joined the Big Ten Conference at its inception in 1896, and other than a hiatus from 1907 to 1916, have been members since. Michigan has won or shared 42 league titles, and, since the inception of the AP Poll in 1936, has finished in the top 10 a total of 37 times. The Wolverines claim 11 national championships, most recently that of the 1997 squad voted atop the final AP Poll. From 1900 to 1989, Michigan was led by a series of nine head coaches, each of whom has been inducted into the College Football Hall of Fame either as a player or as a coach. Fielding H. Yost became Michigan's head coach in 1901 and guided his "Point-a-Minute" squads to a streak of 56 games without a defeat, spanning from his arrival until the season finale in 1905, including a victory in the 1902 Rose Bowl, the first college football bowl game ever played. Fritz Crisler brought his winged helmet from Princeton University in 1938 and led the 1947 Wolverines to a national title and Michigan's second Rose Bowl win. Bo Schembechler coached the team for 21 seasons (1969–1989) in which he won 13 Big Ten titles and 194 games, a program record. The first decade of his tenure was underscored by a fierce competition with his former mentor, Woody Hayes, whose Ohio State Buckeyes squared off against Schembechler's Wolverines in a stretch of the Michigan–Ohio State rivalry dubbed the "Ten-Year War". Following Schembechler's retirement, the program was coached by two of his former assistants, Gary Moeller and then Lloyd Carr, who maintained the program's overall success over the next 18 years. However, the program's fortunes declined under the next two coaches, Rich Rodriguez and Brady Hoke, who were both fired after relatively short tenures. Following Hoke's dismissal, Michigan hired Jim Harbaugh on December 30, 2014. Harbaugh is a former quarterback of the team, having played for Michigan between 1983 and 1986 under Schembechler. The Michigan Wolverines have featured 78 players that have garnered consensus selection to the College Football All-America Team. Three Wolverines have won the Heisman Trophy: Tom Harmon in 1940, Desmond Howard in 1991, and Charles Woodson in 1997. Gerald Ford, who would later become the 38th President of the United States, started at center and was voted most valuable player by his teammates on the 1934 team. 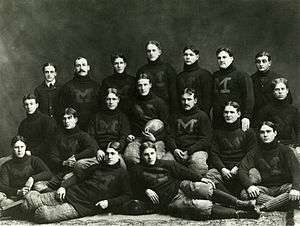 On May 30, 1879, Michigan played its first intercollegiate football game against Racine College at White Stocking Park in Chicago. The Chicago Tribune called it "the first rugby-football game to be played west of the Alleghenies." Midway through "the first 'inning'," Irving Kane Pond scored the first touchdown for Michigan. According to Will Perry's history of Michigan football, the crowd responded to Pond's plays with cheers of "Pond Forever." In 1881, Michigan played against Harvard in Boston. The game that marked the birth of inter-sectional football. On their way to a game in Chicago in 1887, Michigan players stopped in South Bend, Indiana and introduced football to students at the University of Notre Dame. 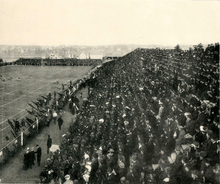 A November 23 contest marked the inception of the Notre Dame Fighting Irish football program and the beginning of the Michigan–Notre Dame rivalry. In 1894, Michigan defeated Cornell, which was the "first time in collegiate football history that a western school defeated an established power from the east." In 1896, the Intercollegiate Conference of Faculty Representatives—then commonly known as the Western Conference and later as the Big Ten Conference—was formed by the University of Michigan, the University of Chicago, the University of Illinois, the University of Minnesota, the University of Wisconsin, Northwestern University, and Purdue University. The first Western Conference football season was played in 1896, with Michigan going 9–1, but losing out on the inaugural Western Conference title with a loss to the Chicago Maroons to end the season. By 1898 Amos Alonzo Stagg was fast at work at turning the University of Chicago football program into a powerhouse. Before the final game of the 1898 season, Chicago was 9–1–1 and Michigan was 9–0; a game between the two teams in Chicago decided the third Western Conference championship. Michigan won, 12–11, capturing the program's first conference championship in a game that inspired "The Victors," which later became the school's fight song. Michigan went 8–2 and 7–2–1 in 1899 and 1900, results that were considered unsatisfactory relative to the 10–0 season of 1898. 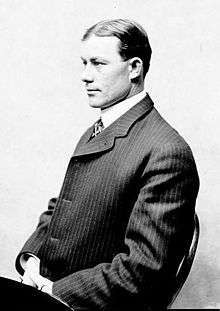 After the 1900 season, Charles A. Baird, Michigan's first athletic director, wrote to Fielding H. Yost, "Our people are greatly roused up over the defeats of the past two years," and gave Yost an offer to come to Michigan to coach the football team. Upon arriving at Michigan, Yost famously ran up State Street and proclaimed to a reporter, "Michigan isn't going to lose a game." Yost certainly delivered, with the 1901 Michigan team demolishing its opponents. In the first season under head coach Yost, a lopsided victory over Buffalo drew national attention and marked the arrival of Yost's "Point-a-Minute" teams. The Buffalo team beat Ivy League power Columbia earlier in the year and was favored over a Michigan team the Buffalo newspapers had dubbed "Woolly Westerners." Michigan scored 22 touchdowns in 38 minutes of play, averaging a touchdown every one minute and 43 seconds. Buffalo quit 15 minutes before the game was scheduled to end. The New York Times reported that Michigan's margin of victory was "one of the most remarkable ever made in the history of football in the important colleges." At the end of the season, Michigan participated in the inaugural Rose Bowl, the first bowl game in American football history. Michigan dominated the game so thoroughly that Stanford's captain requested the game be called with eight minutes remaining. Neil Snow scored five touchdowns in the game, which is still the all-time Rose Bowl record. The Tournament of Roses Association held chariot races and other events in lieu of a football game for the next 15 years. The next year, 1902, featured a contest between Michigan and the Wisconsin Badgers. The two teams were undefeated since 1900, and the crowd (20,000–22,000) was the largest in western football history. Michigan won, 6–0, leading the Detroit Free Press to call it "the greatest football game ever played on a western gridiron." The undefeated 1902 team outscored its opponents 644 to 12 on its way to an 11–0 season. In 1903, Michigan played a game against Minnesota that started the rivalry for the Little Brown Jug, the oldest rivalry trophy in college football. Yost sent a student assistant to purchase a five-gallon water jug from a local store. After the game ended in a tie, Yost forgot the jug in the locker room. Custodian Oscar Munson discovered it and brought it to L. J. Cooke, who painted the jug brown and wrote "Michigan Jug – Captured by Oscar, October 31, 1903. Michigan 6, Minnesota 6." When Yost requested that the jug be returned, Cooke responded that "if you want it, you'll have to win it." The game marked the only time from 1901 to 1904 that Michigan failed to win. Michigan finished the season at 11–0–1. In 1904, Michigan once again went undefeated at 10–0 while recording the most lopsided defeat in college football history, a 130–0 defeat of the West Virginia Mountaineers. Formal dedication of Michigan Stadium on October 22, 1927 in a game against the Ohio State Buckeyes. From 1901 through 1904, Michigan didn't lose a single game. The streak was finally halted at the end of the 1905 season by Amos Alonzo Stagg's Chicago Maroons, a team that went on to win two Big 9 (as the Western Conference was now being called with the addition of Iowa and Indiana) titles in the next three years. The game, dubbed "The First Greatest Game of the Century," broke Michigan's 56-game unbeaten streak and marked the end of the "Point-a-Minute" years. The 1905 Michigan team had outscored opponents 495–0 in its first 12 games. The game was lost in the final ten minutes of play when Denny Clark was tackled for a safety as he attempted to return a punt from behind the goal line. Michigan tied for another Big 9 title in 1906 before opting to go independent for the 1907 season. The independent years were not as kind to Yost as his years in the Big 9. Michigan suffered one loss in 1907. In 1908, Michigan got battered by Penn (a team that went 11–0–1 that year) in a game in which Michigan center Germany Schulz took such a battering as to have to be dragged off the field. In 1909, Michigan suffered its first loss to Notre Dame, leading Yost to refuse to schedule another game against Notre Dame; the schools did not play again until 1942. In 1910, Michigan played their only undefeated season of the independent years, going 3–0–3. Overall from 1907 to 1916, Michigan lost at least one game every year (with the exception of 1910). Michigan rejoined the Big 9 in 1917, after which it was called the Big Ten. Yost immediately got back to work. In 1918, Michigan okated the first game against Stagg's Chicago Maroons since Chicago ended Michigan's winning streak in 1905. Michigan defeated the Maroons, 18–0, on the way to a 5–0 record. The next three years were lean, with Michigan going 3–4, 5–2, and 5–1–1, in 1919, 1920, and 1921. However, in 1922 Michigan managed to spoil the "Dedication Day" for Ohio Stadium, defeating the Buckeyes 19–0. Legend has it that the rotunda at Ohio Stadium is painted with maize flowers on a blue background due to the outcome of the 1922 dedication game. Michigan went 5–0–1 in 1922, capturing a Big Ten title. In 1923, Michigan went 8–0, winning another conference championship. The 1924 Wolverines, coached by George Little, saw their 20-game unbeaten streak end at the hands of Red Grange. After the 1924 season, Little left Michigan to accept the head coach and athletic director positions at Wisconsin, returning athletic director Yost to the head coaching position. Although the 1925 and 1926 seasons did not include a conference title, they were memorable due to the presence of the famous "Benny-to-Bennie" combination, a reference to Benny Friedman and Bennie Oosterbaan. The two helped popularize passing the ball in an era when running held dominance. Oosterbaan became a three-time All-American and was selected for the All-Time All-American team in 1951, while Friedman went on to have a Hall of Fame NFL career. Also during 1926, Michigan was retroactively awarded national titles for the 1901 and 1902 seasons via the Houlgate System, the first national titles awarded to the program. Other major selectors later retroactively awarded Michigan with titles in the 1903, 1904, 1918, 1923, 1925, and 1926 seasons. Michigan currently claims titles in the 1901, 1902, 1903, 1904, 1918, and 1923 seasons. Yost stepped aside in 1926 to focus on being Michigan's athletic director, a post he had held since 1921, thus ending the greatest period of success in the history of Michigan football. Under Yost, Michigan posted a 165–29–10 record, winning ten conference championships and six national championships. One of his main actions as athletic director was to oversee the construction of Michigan Stadium. Michigan began playing football games in Michigan Stadium in the fall of 1927. At the time Michigan Stadium had a capacity of 72,000, although Yost envisioned eventually expanding the stadium to a capacity well beyond 100,000. Michigan Stadium was formally dedicated during a game against the Ohio State Buckeyes that season to the tune of a 21–0 victory. Elton Wieman became Michigan's head coach in 1927. That year, Michigan posted a modest 6–2 record. However, the team ended 1928 with a losing 3–4–1 record and Wieman was fired. In 1929, Harry Kipke, a former player under Yost, took over as head coach. From 1930 to 1933, Kipke returned Michigan to prominence. During that stretch, Michigan won the Big Ten title every year and the national championship in 1932 and 1933. During this span Kipke's teams only lost one game, to Ohio State. After 1933, Kipke's teams fell off the map, going 12–22 from 1934 to 1937. The 1934 Michigan team only won one game, against Georgia Tech in a controversial contest. Georgia Tech coach and athletic director W. A. "Bill" Alexander refused to allow his team to take the field if Willis Ward, an African-American player for Michigan, stepped on the field. Michigan conceded, and the incident reportedly caused Michigan player Gerald R. Ford to consider quitting the team. Needless to say, four years without success had become unacceptable at Michigan, and Yost began work on hiring another head coach. Overall, Kipke posted a 49–26–4 record at Michigan, winning four conference championships and two national championships. 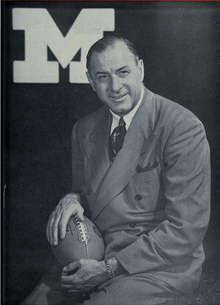 In 1938, Michigan hired Fritz Crisler as Kipke's successor. Crisler had been head coach of the Princeton Tigers and reportedly wasn't excited to leave Princeton. Michigan invited him to name his price, and Crisler demanded what he thought would be unacceptable: the position of athletic director when Yost stepped down and the highest salary in college football. Michigan accepted, and Crisler became the new head coach of the Michigan football program. Upon arriving at Michigan, Crisler introduced the winged football helmet, ostensibly to help his players find the receivers down field. Whatever the reasoning, the winged helmet has since become one of the iconic marks of Michigan football. Michigan debuted the winged helmet in a game against Michigan State in 1938. Two years later in 1940, Tom Harmon led the Wolverines to a 7–1 record on his way to winning the Heisman Trophy. Harmon ended the season by scoring three rushing touchdowns, two passing touchdowns, four extra points, intercepting three passes, and punting three times for an average of 50 yards in a game against the Ohio State Buckeyes. The 1943 season included a No. 1 (Notre Dame) vs. No. 2 (Michigan) match-up against Notre Dame, a game the Wolverines lost 35–12. Michigan ended the season at 8–1, winning Crisler's first Big Ten championship. Crisler had reversed the misfortune of the end of the Kipke era and returned Michigan to one and two-loss seasons. From 1938 to 1944, Michigan posted a 48–11–2 record, although the period lacked a national title and only contained one conference title. Yet, Crisler's biggest mark on the game of football was made in 1945, when Michigan faced a loaded Army squad that featured two Heisman trophy winners, Doc Blanchard and Glenn Davis. Crisler didn't feel that his Michigan team could match up with Army, so he opted to take advantage of a 1941 NCAA rule that allowed players to enter or leave at any point during the game. Crisler divided his team into "offensive" and "defensive" specialists, an act that earned him the nickname "the father of two-platoon football." Michigan still lost the game with Army 28–7, but Crisler's use of two-platoon football shaped the way the game was played in the future. Eventually, Crisler's use of the platoon system propelled his team to a conference championship and a national title in 1947, his final season. The 1947 team, nicknamed the "Mad Magicians" due to their use of two-platoon football, capped their season with a 49–0 victory over the USC Trojans in the 1948 Rose Bowl. Crisler finished with a 116–32–9 record at Michigan, winning two conference titles and one national title. Crisler continued as athletic director while Bennie Oosterbaan, the same Bennie that had electrified the world while making connections with Benny Friedman 20 years earlier, took over the football program. Things started off well for Oosterbaan in 1948 with the Wolverines earning a quality mid-season victory over #3 Northwestern. Michigan finished the season undefeated at 9–0, thus winning another national championship. Initially, Oosterbaan continued Crisler's tradition of on-field success, winning conference titles each year from 1948 to 1950 and the national title in 1948. The 1950 season ended in interesting fashion, with Michigan and Ohio State combining for 45 punts in a game that came to be known as the "Snow Bowl." Michigan won the game 9–3, winning the Big Ten conference and sending the Wolverines off to the 1951 Rose Bowl. Subsequently, Michigan's football team began to decline under Oosterbaan. From 1951 to 1958, Michigan compiled a record of 42–26–2, a far cry from the success under Crisler and Yost. Perhaps more importantly, Oosterbaan posted a 2–5–1 record against Michigan State and a 3–5 record against Ohio State over the same time period. Under mounting pressure, Oosterbaan stepped down after 1958. In place of Oosterbaan stepped Bump Elliott, a former Michigan player of Crisler's. Elliott continued many of the struggles that began under Oosterbaan, posting a 51–42–2 record from 1959 through 1968 (including a 2–7–1 record against Michigan State and a 3–7 record against Ohio State). Michigan's only Big Ten title under Elliott came in 1964, a season that included a win over Oregon State in the 1965 Rose Bowl. Following a 50-14 drubbing at the hands of Ohio State in 1968, Elliott resigned, opening the way for Michigan athletic director Don Canham to hire Bo Schembechler. It took 15 minutes for Don Canham to be sold on Bo Schembechler, resulting in Schembechler becoming the 15th coach in Michigan football history. At the time, Schembechler's current employer, the Miami RedHawks, could have thrown more money at Schembechler, but Canham managed to sell Schembechler on Michigan's tradition and prestige. Schembechler's respect for Michigan was evident early on when assistants complained about how the equipment they had was worse than what they had to work with at Miami. Schembechler gestured to a rusty chair and said, "See this chair? Fielding Yost sat in this chair. See this nail? Fielding Yost hung his hat on that nail. And you're telling me we had better stuff at Miami? No men, we didn't. We have tradition here, Michigan tradition, and that's something no one else has!" Schembechler immediately got to work in turning around his team. He had a reputation for being hard on his players, causing 65 of his 140 players to quit the team before the season even started. In response, Schembechler promised his team "Those Who Stay Will be Champions," assuring the players that remained that their efforts would be rewarded. Schembechler's first team got off to a moderate start, losing to rival Michigan State and entering the Ohio State game with a 7–2 record. Ohio State, coached by icon Woody Hayes, entered the game at 8–0 and poised to repeat as national champions. The 1969 Ohio State team was hailed by some as being the "greatest college football team ever assembled" and came into the game favored by 17 points over Michigan. Michigan shocked the Buckeyes, winning 24–12, going to the Rose Bowl, and launching The Ten Year War between Hayes and Schembechler. From 1969 to 1978, one of either Ohio State or Michigan won at least a share of the Big Ten title and represented the Big Ten in the Rose Bowl every season. In 1970 Schembechler failed to repeat on the magic of 1969, that year losing to Ohio State 20–9 and finishing at 9–1. However, in 1971, Schembechler led Michigan to an undefeated regular season, only to lose to the Stanford Indians in the Rose Bowl to finish at 11–1 and miss out on a chance at a national championship. From 1972 to 1975, Michigan failed to win a game against Ohio State (powered by phenom running back Archie Griffin), finishing at 10–1, 10–0–1, 10–1, and 8–2–2. However, Michigan did tie Ohio State in 1973, only missing out on the Rose Bowl due to a controversial vote that sent Ohio State to the Rose Bowl and left Michigan at home. Another notable event occurred during the 1975 season, with the first of Michigan's record streak of games with more than 100,000 people in attendance occurring during a game against the Purdue Boilermakers. 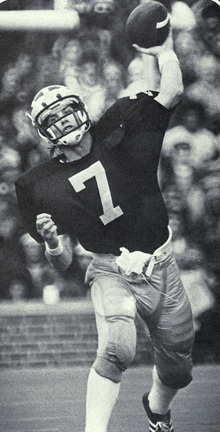 Rick Leach, who played quarterback for Michigan from 1975 through 1978. From 1976 to 1978, Michigan asserted its own dominance of the rivalry, beating Ohio State, going to the Rose Bowl, and posting a 10–2 record every year. After the 1978 season, Woody Hayes was fired for punching an opposing player during the 1978 Gator Bowl, thus ending The Ten Year War. Michigan had a slight edge in the war, with Schembechler going 5–4–1 against Hayes. However, while Schembechler successfully placed great emphasis on the rivalry, Michigan's bowl performances were sub-par. Michigan failed to win their last game of the season every year during The Ten Year War. The only year in which Michigan didn't lose its last game of the season was the 1973 tie against Ohio State. After the end of the Ten Year War, Michigan's regular season performance declined, but their post season performance improved. The 1979 season included a memorable game against Indiana that ended with a touchdown pass from John Wangler to Anthony Carter with six seconds left in the game. The play was made famous by Bob Ufer's emotional radio narration: "Under center is Wangler at the 45, he goes back. He's looking for a receiver. He throws downfield to Carter. Carter has it. [unintelligible screaming] Carter scores. . . . I have never seen anything like this in all my 40 years of covering Michigan football. . . . I hope you can hear me – because I've never been so happy in all my cotton-picking 59 years! . . . Johnny Wangler to Anthony Carter will be heard until another 100 years of Michigan football is played! . . . Meeeshigan wins, 27 to 21. They aren't even going to try the extra point. Who cares? Who gives a damn?". Michigan went 8–4 on the season, losing to North Carolina in the 1979 Gator Bowl. In 1980, Michigan went 10–2 and got their first win in the Rose Bowl under Schembechler, a 23–6 win over Washington. Michigan went 9–3 in 1981 to get Schembechler's second bowl win in the 1981 Bluebonnet Bowl. In 1982, Michigan won the Big Ten championship while being led by three-time All-American wide receiver Anthony Carter. Michigan fell to UCLA Bruins in the 1983 Rose Bowl. Without Anthony Carter, the Wolverines did not win the Big Ten title in 1983, going 9–3. In 1984, the Wolverines suffered their worst season under Schembechler, going 6–6 with a loss to national champion BYU in the 1984 Holiday Bowl. Michigan needed to reverse its fortunes in 1985, and they began doing so with new quarterback Jim Harbaugh. Harbaugh led the Wolverines to a 5–0 record, propelling them to a No. 2 ranking heading into a game with the #1 Iowa Hawkeyes. Michigan lost 12–10, but did not lose another game the rest of the season to finish at 10–1–1 with a victory over Tom Osborne's Nebraska Cornhuskers in the 1986 Fiesta Bowl. In 1986 Michigan won the Big Ten at 11–2, suffering a loss to the Arizona State Sun Devils in the 1987 Rose Bowl. The departure of Harbaugh after 1986 once again left Michigan on tough times as Schembechler's team stumbled to an 8–4 record in 1987. However, Michigan bounced back again in 1988 and 1989, winning the Big Ten title outright both years at 9–2–1 and 10–2 with trips to Rose Bowl. From 1981 through 1989, Michigan went 80–27–2, winning four Big Ten titles and going to a bowl game every year (with another Rose Bowl win obtained against USC Trojans after the 1988 season). Bo Schembechler retired after the 1989 season, handing the job over to his offensive coordinator Gary Moeller. Under Schembechler, Michigan posted a 194–48–5 record (11–9–1 against Ohio State), and won 13 Big Ten championships. Gary Moeller took over from Schembechler for the 1990 season, becoming the 16th head coach in Michigan football history. Moeller inherited a talented squad that had just played in the 1990 Rose Bowl, including wide receiver Desmond Howard. Moeller led Michigan to a 9–3 record in his first season, tying for the Big Ten championship but losing out on a Rose Bowl bid to Iowa. The next two years, Moeller's teams won the conference outright, setting marks of 10–2 and 9–0–3. 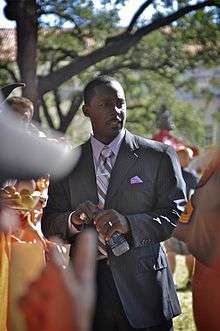 In 1991, Desmond Howard had a memorable season that propelled him to win the Heisman Trophy, the award given to college football's most outstanding player. The 1992 team, led by quarterback Elvis Grbac, posted a 9–0–3 record, defeating Washington in the 1993 Rose Bowl. 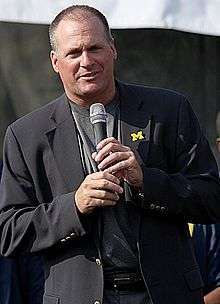 Moeller led Michigan to 8–4 records in both 1993 and 1994. The 1994 season was marked by an early-season loss to Colorado that included a Hail Mary pass from Kordell Stewart to Michael Westbrook to end the game, leading to the game being dubbed "The Miracle at Michigan." After the 1994 season, Moeller was found intoxicated at a Southfield, MI restaurant in an incident in which Moeller was caught on tape throwing a punch in a police station, which resulted in his firing. Michigan's athletic director appointed Lloyd Carr as interim head coach for the 1995 season. Carr became the permanent head coach after an 8–2 start and Michigan finished his first season at 9–4. Carr had similar success in his second season, going 8–4 and earning a trip to the 1997 Outback Bowl. Carr returned a strong squad for the 1997 season, led by cornerback and punt returner Charles Woodson. Michigan went undefeated in 1997, with the defense smothering opponents; the only team to score more than 16 points on Michigan that year were the Iowa Hawkeyes. Overall, the Michigan defense only allowed 9.5 points per game and ended the season ranked No. 1 in the AP Poll, giving Michigan its first national championship since 1948 with a victory in the 1998 Rose Bowl. 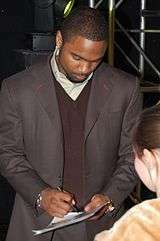 For his efforts, Woodson won the Heisman Trophy and was selected 4th overall in the 1998 NFL Draft by the Oakland Raiders. During this era under Carr, Michigan began to establish for itself a reputation as a quarterback school, with future NFL quarterbacks such as Brian Griese (1993–1997), Tom Brady (1996–1999), Drew Henson (1998–2000), John Navarre (1999–2003), and Chad Henne (2004–2007) all playing for Michigan. With this string of quarterbacks, Michigan had a starting quarterback that later joined the NFL every year from 1993 through 2007. Under Tom Brady, Michigan went 10–3 and repeated as Big Ten champions in 1998, but in 1999 Michigan lost out on the conference championship at 10–2 to a Wisconsin Badgers team led by Ron Dayne. Drew Henson led Michigan to a 9–3 record and a tie for the Big Ten championship in 2000. 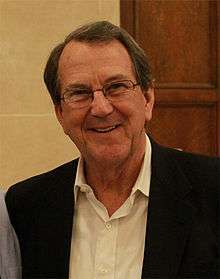 During Lloyd Carr's first six years, he had compiled an excellent record of 5–1 against the Ohio State Buckeyes. Ohio State's coach, John Cooper, had compiled a 2–10–1 record against Schembechler, Moeller, and Carr. On top of that, Ohio State had entered the game against Michigan undefeated with national championship aspirations on three of those occasions (1993, 1995, and 1996). This, combined with Cooper's 3–8 bowl record led to his firing after the 2000 season and replacement by Jim Tressel. Tressel immediately ushered in a new era in the Ohio State-Michigan rivalry, upsetting the Wolverines 26–20 in 2001, his first season at the helm. This came on the heels of another last-second loss in which Michigan State defeated Michigan with a pass in the last second of the game in a controversial finish that led to the game being referred to as "Clockgate." Despite these setbacks, Michigan's 2001 squad, led by John Navarre, went 8–4 with an appearance in the 2002 Florida Citrus Bowl. Again under Navarre in 2002, Michigan compiled a 10–3 record, but included another loss to Ohio State, who went on to win the national championship. Carr got over the hump against Tressel in 2003 as John Navarre and Doak Walker Award-winning running back Chris Perry led the Wolverines to a 10–3 record, a Big Ten championship, and an appearance in the 2004 Rose Bowl. 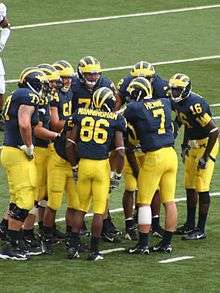 2006 Michigan Wolverines huddle during a game against the Central Michigan Chippewas. For the 2004 season, Carr turned to highly rated recruit Chad Henne to lead the Wolverines at quarterback. Michigan went 9–3 to tie for another Big Ten championship and earn a trip to the 2005 Rose Bowl, but the season again included a loss to Ohio State, who only went 8–4 on the season. Carr, who had started off with a stellar record against Cooper's Ohio State, seemed to have much more trouble beating Tressel's version of the Buckeyes. In addition, Michigan was beginning to have a reputation for struggling with the spread offense, with teams such as the Purdue Boilermakers led by Drew Brees in 2000, the Oregon Ducks in 2003, and the Texas Longhorns led by Vince Young in the 2005 Rose Bowl all putting many points on Lloyd Carr's defense. In 2005, Michigan struggled to make a bowl game, only going 7–5, with the season capped with another loss to Ohio State. Expectations were tempered going into the 2006 season; however, a 47–21 blowout of #2 Notre Dame and an 11–0 start propelled Michigan to the No. 2 rankings going into "The Game" with #1 Ohio State. The 2006 Ohio State-Michigan game was hailed by the media as the "The Game of the Century." The day before the game, Bo Schembechler died, leading Ohio State to honor him with a moment of silence, one of the few Michigan Men to be so honored in Ohio Stadium. The game itself was a back-and-forth affair, with Ohio State winning 42–39 for the right to play in the 2007 BCS National Championship Game. Michigan lost to USC in the 2007 Rose Bowl, ending the season at 11–2. Going into 2007, Michigan had high expectations. Standout players Chad Henne, Mike Hart, and Jake Long all opted to return for their senior seasons for one last crack at Ohio State and a chance at a national championship, causing Michigan to be ranked fifth in the preseason polls. However, Michigan's struggles against the spread offense reared its ugly head again as the Wolverines shockingly lose the opener to the Appalachian State Mountaineers. The game marked the first win by a Division I-AA team over a team ranked in the Associated Press Poll. The next week, Michigan was blown out by Oregon, another spread team. Despite the early rough start, Michigan won their next eight games and went into the Ohio State game with a chance to win the Big Ten championship. However, Michigan once again fell to the Buckeyes, this time 14–3. After the game, Lloyd Carr announced that he would retire from Michigan after the bowl game. In the 2008 Capital One Bowl, Carr's final game, Michigan defeated the defending national champion Florida Gators, led by Heisman Trophy winner Tim Tebow, 41–35. Carr's accomplishments at Michigan included a 122–40 record, five Big Ten championships, and one national championship. Rich Rodriguez at Michigan in 2008. Following Carr's retirement, Michigan launched a coaching search that ultimately saw Rich Rodriguez lured away from his alma mater, West Virginia. Rodriguez's arrival marked the beginning of major upheaval in the Michigan football program. Rodriguez, a proponent of the spread offense, installed it in place of the pro-style offense that had been used by Carr. The offseason saw significant attrition in Michigan's roster. The expected starting quarterback Ryan Mallett departed the program, stating that he would be unable to fit in a spread offense. Starting wide receivers Mario Manningham and Adrian Arrington both decided to forgo their senior seasons and enter the NFL Draft. Michigan lost a good deal of its depth and, when the 2008 season began, was forced to start players with very little playing experience. The 2008 season was disappointing for Michigan, finishing at 3–9 and suffering its first losing campaign since 1967. Michigan also missed a bowl game invitation for the first time since 1974. For the 2009 season the team saw many changes from the previous year. A new practice facility replaced Oosterbaan Fieldhouse as Michigan's indoor practice facility, and two new quarterbacks, Tate Forcier and Denard Robinson, became the focus of the offseason. The week before the season began, however, the Detroit Free Press accused the team of violating the NCAA's practice time limits. While the NCAA conducted investigations, Michigan won its first four games, including a last second victory against its rival Notre Dame. The season ended in disappointment, however, as Michigan went 1–7 in its last eight games and missed a bowl for the second straight season. Rodriguez's final season began with new hope in the program, as Robinson was named the starting quarterback over Forcier. Robinson led the Wolverines to a 5–0 start, but after a defeat to Michigan State at home, the Wolverines finished the season 2–5 over their last seven games. Michigan did, however, qualify for a bowl game with a 7–5 record, and clinched its bowl berth in dramatic fashion against Illinois, with Michigan winning 67–65 in three overtime periods. The game was the highest combined scoring game in Michigan history, and saw Michigan's defense give up the most points in its history. Michigan was invited to the Gator Bowl to face Mississippi State, where it lost 52–14. The Michigan defense set new school records as the worst defense in Michigan history. In the middle of the season, the NCAA announced its penalties against Michigan for the practice time violations. The program was placed on three years probation and docked 130 practice hours, which was twice the amount Michigan had exceeded. Rodriguez was fired following the bowl game, with athletic director David Brandon citing Rodriguez's failure to meet expectations as the main reason for his dismissal. Rodriguez left the program winless against rivals Michigan State and Ohio State and compiled a 15–22 record, the worst record of any head coach in Michigan history. Athletic director David Brandon (left) with head coach Brady Hoke in 2011. Michigan announced the hiring of head coach Brady Hoke on January 11, 2011. He became the 19th head coach in Michigan football history. Hoke had previously been the head coach at his alma mater Ball State and then San Diego State after serving as an assistant at Michigan under Lloyd Carr from 1995 to 2002. In his first season, Hoke led the Wolverines to 11 wins, beating rival Notre Dame with a spectacular comeback in Michigan's first night game at Michigan Stadium. Despite losing to Iowa and Michigan State, the Wolverines finished with a 10–2 regular season record with their first win over Ohio State in eight years. The Wolverines received an invitation to the Sugar Bowl in which they defeated Virginia Tech, 23–20, in overtime. This was the program's first bowl win since the season of 2007. Until the streak was broken in 2008, Michigan had appeared in a bowl game each year since the 1975 season. In Hoke's second season, he led Michigan to an 8–5 record and an appearance in the 2013 Outback Bowl. The Wolverines dropped their season opener to eventual national champions, Alabama in Dallas, Texas. U-M won the next two games at home in non-conference bouts against Air Force and UMass, totaling 94 points over the two games. Michigan then traveled to face eventual national runner-up Notre Dame. In this game, the Wolverines committed six turnovers, including five interceptions, as they fell to the Fighting Irish by a 13–6 final. After back-to-back wins over Purdue and Illinois, they defeated in-state rival Michigan State for the first time since 2007. The win was the 900th in program history, becoming the first program to reach the milestone. U-M finished the season with wins over Minnesota, Northwestern and Iowa as well as losses to Nebraska and Ohio State to finish the regular season. Michigan was selected to participate in the 2013 Outback Bowl, where they fell to South Carolina by a 33–28 score. In the 2013 campaign, Michigan finished with a 7–6 record, including a 3–5 record in Big Ten play and a loss to Kansas State in the Buffalo Wild Wings Bowl 31-14. On December 2, 2014, Hoke was fired as the head coach after four seasons following a 5–7 record in 2014. This marked only the third season since 1975 in which Michigan missed a bowl game. Hoke compiled a 31–20 record, including an 18–14 record in Big Ten play. On December 30, 2014, the University announced the hiring of Jim Harbaugh as the team's 20th head coach. Harbaugh, who was starting quarterback in the early 1980s under Bo Schembechler, had most recently served as head coach of the San Francisco 49ers. In his first season, Harbaugh led Michigan to a 10–3 record, including a 41–7 win over the Florida Gators in the Citrus Bowl. In the early days of Michigan football, Michigan played smaller home games at the Washtenaw County Fairgrounds with larger games being held in Detroit at the Detroit Athletic Club. The Fairgrounds were originally located at the southeast intersection of Hill and Forest, but in 1890 moved to what is now called Burns Park. In 1890, the Board of Regents authorized $3,000 ($78,947.37 in 2014 dollars) for the purchase of a parcel of land along South State Street. In 1891 a further $4,500 ($118,421.05 in 2014 dollars) was authorized "for the purpose of fitting up the athletic field." Michigan began play on Regents Field in 1893, with capacity being expanded to over 15,000 by the end of the field's use. By 1902 Regents Field had grown inadequate for the uses of the football team as a result of the sport's increasing popularity. Thanks to donations from Dexter M. Ferry, work began on planning the next home stadium for the Michigan football team. Powered by a $30,000 donation from Ferry, Ferry Field was constructed with a maximum temporary capacity of 18,000 for the 1906 season. Ferry Field would later be expanded to 21,000 in 1914 and 42,000 in 1921. However, attendance was often over-capacity with crowds of 48,000 cramming into the small stadium. This prompted athletic director Fielding Yost to contemplate the construction of a much larger stadium. Fielding H. Yost anticipated massive crowds as college football's popularity increased and wished to build a stadium with a capacity of at least 80,000. Ultimately, the final plans authorized the construction of a stadium with a capacity of 72,000 with footings to be set in place to expand it beyond 100,000 later. Michigan Stadium was dedicated in 1927 during a game against the Ohio State Buckeyes, drawing an over-capacity crowd of 84,401. After World War II, crowd sizes increased, prompting another stadium expansion to a capacity of 93,894 in 1949. Michigan Stadium cracked the 100,000 mark by expanding to 101,001 in 1955. Michigan Stadium temporarily lost the title of "largest stadium" to Neyland Stadium of the Tennessee Volunteers in 1996, but would recapture the title in 1998 with another expansion to 107,501. In 2007, the Board of Regents authorized a $226 million renovation to add a new press box, 83 luxury boxes, and 3,200 club seats. For the 2011 season, lights were installed at Michigan Stadium at the cost of $1.8 million. This allowed Michigan to play its first night game at home against Notre Dame in 2011. Michigan and Ohio State first played each other in 1897 and have since played in 112 contests with Michigan holding a 58–48–6 advantage. Ohio State's victory in 2010 was vacated. The rivalry was particularly enhanced during The Ten Year War, a period in which Ohio State was coached by Woody Hayes and Michigan was coached by Bo Schembechler. Overall, the Buckeye and Wolverine football programs have combined for 19 national titles, 77 conference titles, and 10 Heisman Trophy winners. Michigan and Michigan State first played each other in 1898. Since then the teams have played 109 contests, with Michigan holding a 69–35–5 advantage. Since Michigan State joined the Big Ten Conference in 1953, the two schools have competed annually for the Paul Bunyan – Governor of Michigan Trophy. The winner retains possession of the trophy until the next year's game. Michigan currently leads the trophy series 36–26–2, and holds the trophy following a 32–23 win in 2016. Michigan plays Minnesota for the Little Brown Jug, with its record in games played for the Jug, which dates to 1909, being 69–23–3. The Wolverines currently hold the trophy, having won the 2015 contest 29–26. The longest streak of games in Division I-A/FBS without being shut out (365). Michigan was not shut out between October 20, 1984, at Iowa, and September 6, 2014, at Notre Dame. Michigan has played in 44 bowl games in its history, compiling a record of 21–23. Before missing a bowl game in 2008, Michigan had made a bowl game 33 years in a row, the second longest streak (as of end of 2013 season) in college football history. From the 1921 to 1945 seasons, the Big Ten Conference did not allow its teams to participate in bowls. From the 1946 to 1974 seasons, only a conference champion, or a surrogate representative, was allowed to attend a bowl, the Rose Bowl, and no team could go two years in a row until the 1972 Rose Bowl, with the exception of Minnesota in 1961 and 1962. Beginning in 2011, previously retired numbers of "Michigan Football Legends" were assigned to and worn by players selected by the head coach. The Legends program was discontinued in July 2015, and the numbers again permanently retired. Announced schedules as of July 28, 2016. Jim Cnockaert (2003). Stadium Stories: Michigan Wolverines: Colorful Tales of the Maize and Blue. Globe Pequot. ISBN 0-7627-2784-5. Kevin Allen; Art Regner; Nate Brown & Bo Schembechler (2005). What it Means to Be a Wolverine: Michigan's Greatest Players, Talk about Michigan Football. Triumph Books. ISBN 1-57243-661-1. John U. Bacon (2011). Three and Out: Rich Rodriguez and the Michigan Wolverines in the Crucible of College Football. Farrar, Straus, and Giroux. ISBN 978-0-8090-9466-0. 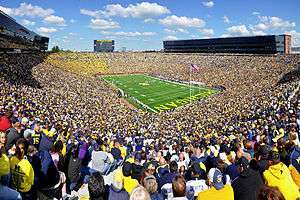 ↑ "U-M Announces New Seating Capacity for Michigan Stadium". University of Michigan Department of Athletics. August 7, 2015. Retrieved August 7, 2015. ↑ "Style Guide: Colors". Office of Global Communications, University of Michigan. 2015-07-07. Retrieved 2015-07-07. ↑ "Fields of (amateur) dreams: the 22 US college football teams with crowds bigger than the NFL average « Sporting Intelligence". Sportingintelligence.com. 2011-02-09. Retrieved 2013-10-20. ↑ "The 10 greatest rivalries". ESPN Internet Ventures. January 3, 2007. Retrieved April 11, 2009. 1 2 Will Perry (1974). The Wolverines: A Story of Michigan Football. The Strode Publishers. p. 27. ISBN 0873970551. ↑ Will Perry (1974). The Wolverines: A Story of Michigan Football. The Strode Publishers. pp. 24–25. ISBN 0873970551. ↑ "IRVING POND, YOUTH OF 72 YEARS, IS WED". The News-Palladium (AP story). June 12, 1929. ↑ "Milestones". Time. June 24, 1929. ↑ David M. Nelson (1994). The Anatomy of a Game: Football, the Rules, and the Men who Made the Game, p. 48. University of Delaware Press. ISBN 0-87413-455-2. ↑ "2007 Notre Dame Media Guide: History and Records (pages 131–175)". und.cstv.com. Retrieved 2008-06-12. ↑ "University of Michigan Football Coaches: William L. McCauley". University of Michigan, Bentley Historical Library. ↑ "Big Ten History". Big Ten Conference. Retrieved January 7, 2012. 1 2 3 4 5 6 7 8 9 10 11 12 13 14 15 16 17 18 19 20 21 22 23 "Big Ten Conference Champions". College Football Data Warehouse. Retrieved January 7, 2012. 1 2 3 4 5 6 7 8 9 10 11 12 13 14 15 16 17 18 19 20 21 22 23 24 25 26 27 28 29 30 31 32 33 34 35 36 37 38 39 40 41 42 43 44 45 46 47 48 49 50 51 52 "All-Time Series Scores vs. Opponents" (PDF). CBS Interactive. Retrieved January 9, 2012. ↑ Bacon, John (2011). Three and Out: Rich Rodriguez and the Michigan Wolverines in the Crucible of College Football. New York: Farrar, Straus, and Giroux. pp. 16–17. ISBN 978-0-8090-9466-0. 1 2 3 4 5 6 7 8 9 10 11 12 13 14 15 16 17 18 19 20 21 22 23 24 25 26 27 28 29 30 31 32 33 34 35 36 37 38 39 40 41 42 43 44 45 46 47 48 "University of Michigan Football Annual Team Records". CBS Interactive. Retrieved January 9, 2012. 1 2 Bacon, John (2011). Three and Out: Rich Rodriguez and the Michigan Wolverines in the Crucible of College Football. New York: Farrar, Straus, and Giroux. p. 17. ISBN 978-0-8090-9466-0. 1 2 William Hanford Edwards (1916). Football Days: Memories of the Game and of the Men behind the Ball. p. 292. ↑ "MICHIGAN MADE HUGE SCORE; Buffalo Football Team, Conquerors of Columbia, Shut Out by Score of 128 to 0" (PDF). The New York Times. October 27, 1901. Retrieved January 23, 2012. ↑ O'Sullivan, Dan (December 13, 2002). "Bowl Championship Series – 1902 – Michigan 49, Stanford 0". ESPN.com/BCSfootball.com. Retrieved April 4, 2011. ↑ "Hall of Famer: Neil Snow". College Football Hall of Fame. ↑ "Michigan's one score enough: Gave Her Victory Over Wisconsin and Bright Hope of Championship' Superb defense of Badgers denied two other promised touchdowns' Only Points Made Were Made in First Seven Minutes, in Opening Onward Rush". Detroit Free Press. November 2, 1902. p. 1. ↑ Lester, Robin. "Michigan-Chicago 1905: The First Greatest Game of the Century" (PDF). Journal of Sport History. Retrieved January 17, 2012. ↑ The Five Greatest Traditions Of Ohio State Football, by Mike Furlan. Retrieved on November 20, 2006. Archived December 2, 2006, at the Wayback Machine. ↑ "George Little". Bentley Historical Library. Retrieved January 10, 2012. ↑ "Bennie Oosterbaan". Bentley Historical Library. Retrieved January 7, 2012. ↑ "Benny Friedman". Pro Football Hall of Fame. Retrieved January 7, 2012. 1 2 3 4 5 6 7 8 9 10 "University of Michigan Football: National Championships". Bentley Historical Library. Retrieved January 7, 2012. ↑ Bacon, John (2011). Three and Out: Rich Rodriguez and the Michigan Wolverines in the Crucible of College Football. New York: Farrar, Straus, and Giroux. p. 19. ISBN 978-0-8090-9466-0. 1 2 3 "Building the Big House". Bentley Historical Library. Retrieved January 7, 2012. ↑ "Michigan Stadium Dedication". Bentley Historical Library. Retrieved January 7, 2012. ↑ "Tad Wieman". College Football at Sports-Reference.com. ↑ Kryk, John (2007). Natural Enemies: Major College Football's Oldest, Fiercest Rivalry—Michigan vs. Notre Dame. p. 109. Retrieved May 31, 2014. ↑ "Harry G. Kipke". Bentley Historical Library. Retrieved January 7, 2012. ↑ "Michigan in the Olympics: 1936 Berlin". The Regents of the University of Michigan. 1 2 Bacon, John (2011). Three and Out: Rich Rodriguez and the Michigan Wolverines in the Crucible of College Football. New York: Farrar, Straus, and Giroux. p. 20. ISBN 978-0-8090-9466-0. ↑ "Michigan's Winged Helmet". Bentley Historical LIbrary. Retrieved January 8, 2012. ↑ "Herbert 0. (Fritz) Crisler". Bentley Historical Library. Retrieved January 8, 2012. ↑ "University of Michigan Athletics -- Football". umich.edu. ↑ "Tom Harmon". Bentley Historical Library. Retrieved January 17, 2012. ↑ "1940 Game, Harmon's Farewell". Michigan Alumnus Magazine. Retrieved January 17, 2012. 1 2 "Fritz Crisler". College Football at Sports-Reference.com. ↑ "Fritz Crisler". College Football Hall of Fame. Retrieved January 8, 2012. ↑ Perry, Will: The Wolverines: A Story of Michigan Football, page 340. The Strode Publishers, 1974. ↑ Bacon, John (2011). Three and Out: Rich Rodriguez and the Michigan Wolverines in the Crucible of College Football. New York: Farrar, Straus, and Giroux. p. 22. ISBN 978-0-8090-9466-0. ↑ Schembechler, Bo; Bacon, John. "Bo's lasting lesson #5: Respect your history". The Regents of the University of Michigan. Retrieved January 8, 2012. 1 2 Bell, Scott. "Those who stay will be champions". The Michigan Daily. Retrieved January 8, 2012. 1 2 Howell, James. "Ohio State Historical Scores". jhowell.net. Retrieved January 8, 2012. ↑ Arnold, Jeff. "Michigan football team entered 1969 Ohio State game full of confidence". AnnArbor.com LLC. Retrieved January 8, 2012. ↑ Boyle, Robert (January 8, 1979). "Scorecard". Sports Illustrated. Retrieved January 8, 2012. ↑ "Bob Ufer – The Voice of Michigan Football". University of Michigan, Bentley Historical Library. ↑ "Original audio of Ufer's play-calling of Wangler's touchdown pass to Carter against Indiana". Bob Ufer – Five Decades of UofM Football. October 27, 1979. ↑ "Anthony Carter". Bentley Historical Library. Retrieved January 8, 2012. ↑ "Jim Harbaugh". Bentley Historical Library. Retrieved January 8, 2012. ↑ "A Classic, 20 Seasons Later". CBS Interactive. Retrieved January 8, 2012. ↑ "One day, Bo Schembechler's grandson will know the greatness of his namesake". ESPN.com. 1 2 "Bo Schembechler". College Football at Sports-Reference.com. ↑ "Schembechler Stepping Down Will Remain As The Ad At Michigan". philly-archives. ↑ "Desmond Howard". Bentley Historical Library. Retrieved January 8, 2012. ↑ Pierson, Don (November 29, 2000). "Fired in Disgrace at Michigan in 1995, Gary Moeller Stuck To His Profession And Has Risen To Lead The Detroit Lions". Chicago Tribune. Retrieved January 8, 2012. ↑ "Lloyd Carr". Bentley Historical Library. Retrieved January 8, 2012. ↑ "Charles Woodson". Bentley Historical Library. Retrieved January 8, 2012. ↑ "Worst Calls in Detroit Sports History". ClickOnDetroit.com. June 3, 2010. Retrieved May 17, 2011. It was November 3, 2001 during a Michigan State vs Michigan game at Spartan Stadium. It was the game also known as '"The Catch," or "Clockgate," or "The Clock Game." ↑ "Michigan stuns Notre Dame, puts up 47 points in South Bend rout". Associated Press. Retrieved January 8, 2012. ↑ "Ohio State mourns death of Bo Schembechler". The Ohio State University. Retrieved January 8, 2012. ↑ "2007 NCAA Football Rankings – Preseason". ESPN.com. Retrieved January 8, 2012. ↑ "Blocked field goal secures Appalachian State's upset of Michigan". Associated Press. Retrieved January 8, 2012. ↑ "Quarterback Mallett leaves Michigan, is considering transfer to Tennessee". ESPN. January 9, 2008. Retrieved December 21, 2011. ↑ "Al Glick Field House". MGoBlue.com. CBS Interactive. Retrieved December 21, 2011. ↑ Rosenberg, Michael & Mark Snyder (August 30, 2009). "A look inside Rodriguez's rigorous football program at Michigan". Detroit Free Press. Retrieved December 21, 2011. ↑ "Recap week 10 Illinois at Michigan". ESPN.com. ESPN. November 6, 2010. Retrieved December 21, 2011. ↑ "NCAA hits Michigan with three years probation, reduction in practice time". USAToday.com. November 4, 2010. Retrieved December 21, 2011. ↑ Tim Rohan (January 5, 2011). "Rodriguez officially fired as head football coach". The Michigan Daily. Retrieved December 21, 2011. ↑ Snyder, Mark. "Brady Hoke named Michigan football coach". Detroit Free Press. Retrieved January 9, 2012. ↑ "Michigan Wolverines vs Kansas State Wildcats - Recap". ESPN.com. ↑ "Hoke Will Not Return as Michigan Football Coach". MGoBlue.com. CBS Interactive. December 2, 2014. Retrieved December 2, 2014. ↑ "Jim Harbaugh Named Michigan Head Football Coach". mgoblue.com. 1 2 "The First "Home Field" – County Fairgrounds". Bentley Historical Library. Retrieved January 9, 2012. 1 2 3 "Regents Field, 1893–1905". Bentley Historical Library. Retrieved January 9, 2012. 1 2 3 4 "Ferry Field, 1906–1926". Bentley Historical Library. Retrieved January 9, 2012. 1 2 3 "Expansion and Renovation, 1928–1997". Bentley Historical Library. Retrieved January 9, 2012. ↑ "Once Again the Biggest House, 1998". Bentley Historical Library. Retrieved January 9, 2012. ↑ Ratkowiak, Courtney; Lincoln, Ruth. "A look inside the renovated Michigan Stadium". The Michigan Daily. Retrieved January 9, 2012. ↑ Ablauf, David. "Permanent Lights to be Installed at Michigan Stadium". CBS Interactive. Retrieved January 9, 2012. ↑ "Under the Lights Program: Michigan vs. Notre Dame". CBS Interactive. Retrieved January 9, 2012. ↑ "Past Division I Football Bowl Subdivision (Division I FBS) National Champions (formerly called Division I-A)". ncaa.org. Archived from the original on March 25, 2008. Retrieved 2008-06-12. ↑ "University of Michigan Football Annual Team Records - MGOBLUE.COM - University of Michigan Official Athletic Site". Mgoblue.Com. Retrieved 2013-10-20. ↑ "University of Michigan Football Annual Team Records". mgoblue.com. 1 2 3 "Previous National Championship Selectors". Cfbdatawarehouse.com. Retrieved 2013-10-20. 1 2 "National Championships". Cfbdatawarehouse.com. Retrieved 2013-10-20. ↑ Consecutive Bowl Appearances College Football Data Warehouse, Accessed December 7, 2010. ↑ "Michigan Football Bo Schembechler Award". The University of Michigan Official Athletic Site. CBS Interactive. Retrieved December 9, 2011. ↑ "Michigan Football Retired Jerseys". MGoBlue.com. CBS Interactive. November 28, 2015. Retrieved November 28, 2015. ↑ "HALL OF FAME INDUCTEE SEARCH". College Football Hall of Fame. Retrieved September 9, 2011. ↑ "Michigan Members of the College Football Hall of Fame". University of Michigan, Bentley Historical Library. May 12, 2008. Retrieved September 9, 2011. ↑ "Hall of Famers by College". Pro Football Hall of Fame. Retrieved October 27, 2009. ↑ "History of the Tournament of Roses Association". Tournament of Roses. ↑ "2011 Michigan Football Guide" (PDF). MGOBLUE.COM – University of Michigan Official Athletic Site. CBS Interactive. pp. 94–95. Retrieved October 22, 2011. ↑ "2011 Michigan Football Guide" (PDF). MGOBLUE.COM – University of Michigan Official Athletic Site. CBS Interactive. pp. 101–103. Retrieved October 22, 2011. ↑ "2011 Big Ten Football Media Guide" (PDF). The Big Ten Conference Official Athletic Site. CBS Interactive. p. 54. Retrieved October 24, 2011. ↑ "2011 Big Ten Football Media Guide" (PDF). The Big Ten Conference Official Athletic Site. CBS Interactive. p. 55. Retrieved October 24, 2011. ↑ "2011 Michigan Football Guide" (PDF). MGOBLUE.COM – University of Michigan Official Athletic Site. CBS Interactive. pp. 104–107. Retrieved October 22, 2011. ↑ "2011 Michigan Football Guide" (PDF). MGOBLUE.COM – University of Michigan Official Athletic Site. CBS Interactive. p. 114. Retrieved October 22, 2011. 1 2 "2011 Big Ten Football Media Guide" (PDF). The Big Ten Conference Official Athletic Site. CBS Interactive. p. 58. Retrieved October 24, 2011. ↑ "2011 Michigan Football Guide" (PDF). MGOBLUE.COM – University of Michigan Official Athletic Site. CBS Interactive. p. 115. Retrieved October 22, 2011. ↑ "FORMER WOLVERINE PLAYERS IN THE NFL (Alphabetical) (As of Oct. 16, 2011)". MGOBLUE.COM – University of Michigan Official Athletic Site. CBS Interactive. October 16, 2011. Retrieved October 22, 2011. Wikimedia Commons has media related to Michigan Wolverines football. 2006 "Game of the Century"